Plata found space just outside the Galaxy penalty area in the 53rd minute after Ned Grabavoy Nat Borchers flicked a pass to the quick forward. The RSL forward took a touch and then latched onto a shot found a way through Penedo's legs, giving Salt Lake the lead against the run of play. 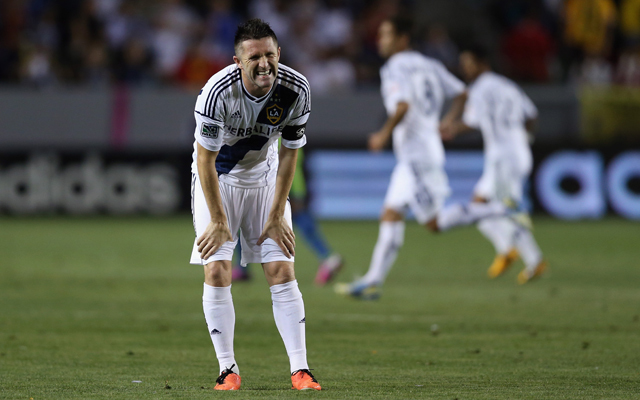 Los Angeles quickly responded, though, and leveled the score just three minutes later when Keane was Able to curl a shot just past Salt Lake goalkeeper Nick Rimando. The Galaxy never looked back from that point on, putting three goals sea behind those of Major League Soccer's top goalkeepers. Keane added his second goal of the night in the 67th minute when he was Able to turn an early cross from Sean Franklin, who came on in the second half, past Rimando. Keane was Able to get the tap-in as the veteran strike knew to run to the near-post and got on the wrong side of the Real defense so he could latch onto Franklin's early ball into the box. LA's newest Designated Player, Omar Gonzalaez, added the game-winning goal in the 75th minute and Keane way the game out of reach for Salt Lake in the 86th minute with his third and final goal of the night.RSL forward Robbie Findley came on in the second half and added a late consolation goal in the fifth minute of stoppage time, but time had run out on Salt Lake and the MLS's top-team dropped three valuable road points to a close competitor in the Western Conference.